On Friday, April 5, theater director Noah Himmelstein joined the students of Prof. Andrew Albin’s ENGL/THEA 4151: Performing Medieval Drama for a workshop on movement, devising, and stagecraft, to help them prepare their upcoming performance of the medieval morality play, Wisdom. Students explored the relationship between allegorical character and physical gesture, building up a bodily vocabulary for a climactic dance-off that tumbles into chaos at the center of the play. 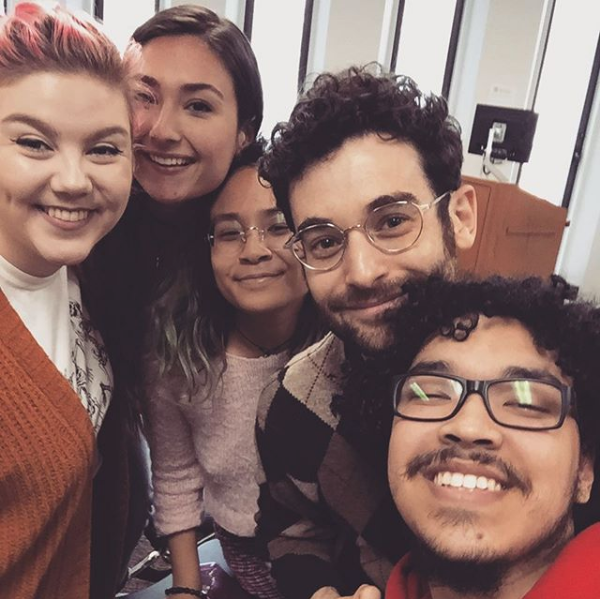 Katie Kudcey, Peri Rohl, Alesha Kilayko, Noah Himmelstein, and Charles Laboy (L-R) take a selfie after a medieval drama workshop and conversation. Wisdom will be performed on Saturday, April 27 at 10:30am, at the entrance to FCLC’s Lowenstein Building on the corner of 60th and 9th. All are invited to come see this inventive, dynamic, and very funny medieval play come to life on the streets of New York! 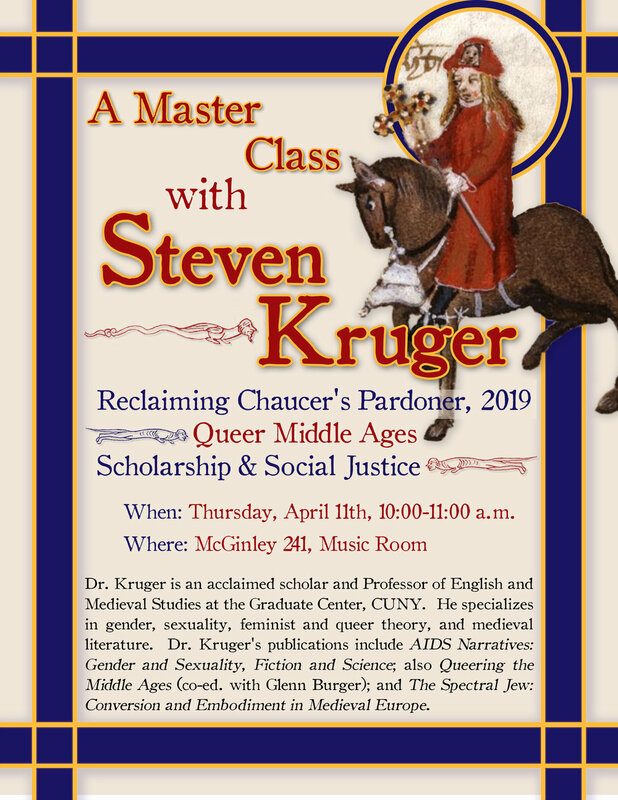 For more information, check out the Fordham Medieval Dramatists’ Facebook page and website. On April 15th, the English department, Kundiman, and the Office of the Chief Diversity Officer co-sponsored Kindred: A Summit for Students & Faculty of Color at Fordham. The distinguished speaker for the night was Jose Antonio Vargas, a Pulitzer Prize-winning journalist, Emmy-nominated filmmaker, and a leading voice for the human rights of undocumented immigrants. The event also featured readings from Ama Codjoe, a poet from Cave Canem, a home for Black poetry, and professor of social justice and inclusion at The New School, and Deborah Paredez, co-founder of CantoMundo, a nonprofit for Latinx literature. The event created a space for students to meet and hear from POC clubs and organizations, as well as to discuss goals for increasing the visibility of POC communities at Fordham. Vargas, author of Dear America: Notes of An Undocumented Citizen, spoke on the history of immigration and assimilation in the United States, the presence of immigrants in our families and nation, and his own status as undocumented. He also addressed his experiences as a person of color outside of the dominant black/white paradigm in the United States. On Wednesday, April 3rd, the English Department hosted Kiese Laymon for the 2019 Reid Writers of Color Reading Series. Laymon is the acclaimed author of Heavy: An American Memoir, as well as How to Slowly Kill Yourself and Others in America and the novel Long Division. Almost 500 students and faculty members attended. Laymon advised students to write to a specific person rather than attempting to write to the universal and cautioned them that authorial intention does not always translate to compelling work. He also spoke on the unique demands of memoir-writing, such as background interviews and obligatory name changes. The reading began with an introduction by the English department’s Dr. Scott Poulson-Bryant. Laymon then took the stage to read a chapter titled “Meager,” which centered on his experience as a black child at a predominately white Catholic school. Anne Marie Ward, FCRH ‘19, expressed her enjoyment of the craft class and reading. “It was an unbelievable and surreal experience hearing Kiese speak to us about his work, and I feel so privileged that I had this opportunity as a creative writer,” she said. Since 2008, the Reid Family Writers of Color Reading Series has brought some of the most celebrated writers of color to Fordham. Events have included readings, master classes and panel discussions. The English Department at Fordham is deeply grateful to the Reid Family for their continuing generosity. To read the rest of the profile—written by Julie Hamon, Art History Media Intern, FCLC ’19—go to Art Ramblings. The article simplifies what had been a much more complex conversation. That said, the fact that the project is getting coverage at all is, according to Pottroff, “mind blowing.” In addition to this, Pottroff and her team are putting out a collection of poetry (modern poets responding to Bradstreet's work) and a mobile game app (like, Pokemon Go, Anne Bradstreet edition). And they’ve actually found an archaeologist who is going to do a scan of Bradstreet’s family property to see if we can find the foundation of her home. On top of this, Pottroff was one of eight people accepted into the First Book Institute at Penn State, where she’ll be workshopping her book project this summer with a distinguished group of early career Americanists. Congratulations to Professor Pottroff on all her great work!